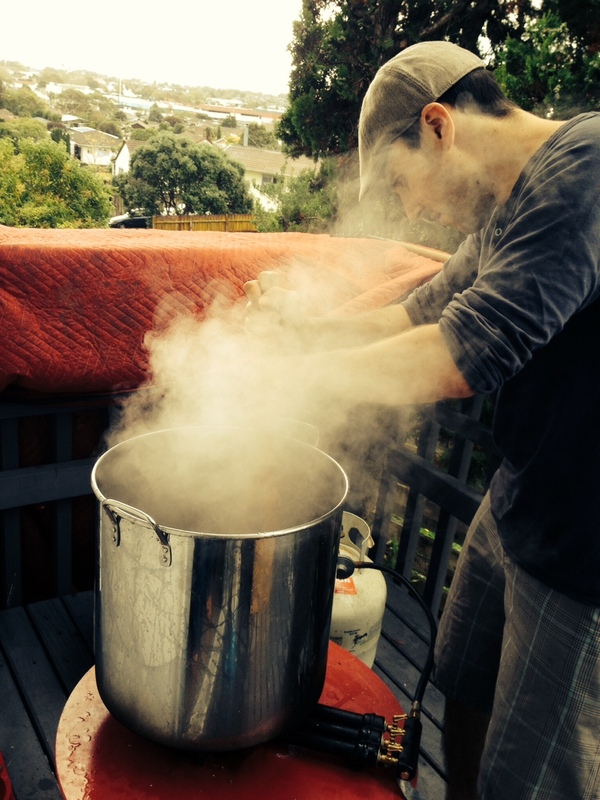 Brew Hui Brews: Pale Ale, v1.0 | Brew Hui. My general method for coping with mechanical failure resembles that of Tintin’s Captain Haddock – whereby the slightest Wrong-Going is swiftly followed by consecutive panels of dagger symbols and exclamation marks. The rough language is usually stored safely within thought bubbles – y’know, the ones that look like lovely soft clouds – but occasionally, the strong stuff makes it into speech bubbles; the ones that are open-access to all within ear-shot. The first Brew Hui brew day was, unfortunately, a speech bubble day. The strong language first made an appearance as I plunged both arms – up to their respective elbows – into Sixty-Degree-Plus sticky sugar-water. The inaugural brew day had turned into a series of unfortunate events – and I was simply beyond caring that I was throwing my arms into something people might actually drink. Gamblers call this tilt – a spiralling emotional state where your decision-making is based less on reality and more on raw emotion. And guess what? Raw emotion is a pretty unstable decision-making platform when you’re trying to solve problems you’ve never encountered before. I’d had a restless sleep the night before, due largely to a concern that my wafer-thin mash tun would prove to be a horrible insulating vessel – causing the temperature to crash and the starch-to-sugar conversion process to grind to a screeching halt. But as in life, the things that I worried about the most wound-up working just fine – while the things I took for granted systematically shat themselves. It all came unstuck at First Runnings – the point in the process where you run-off (into a jug or similar) a bit of the mucky liquid from the mash until it runs clear, at which point you can direct the hose straight into the brew kettle. So far, the mash had gone perfectly – the temperature only dipping 2-3 degrees from its initial 67 – and I’d even taken Kids Four and Two to the playground to earn some Daddy Points before the brew required my undivided attention. With the family busy tucking-in to morning tea, I twisted the valve at the front of the mash tun to draw the first runnings…and nothing came out. To slightly abridge the clusterf**k, it turns out that my mash tun design has a fundamental flaw: because the false bottom’s diameter is quite a bit smaller than that of the mash tun, it’s possible for the grain to make its way under the false bottom and then clog the whole thing up – hence the thin air that escaped when I turned the valve. Rather than figuring this out ahead of time, it took the gentle par-boiling of both my arms to wake me up to a rather-obvious design flaw. 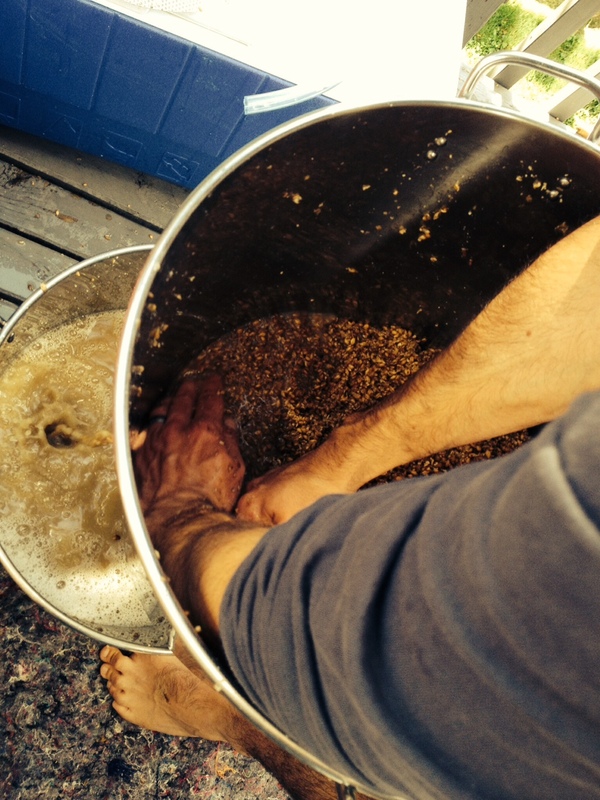 I was faced with a mash tun full of sticky goodness, but no conventional way to grab it. To add to the clusterf**k, without a working false bottom I had no way to properly ‘sparge’ the maximum amount of sugar from the grain (achieved by running fresh, pre-heated water through the mash tun and into the brew kettle). The only solution that my On-Tilt brain could proffer was to pull-apart the valve – essentially leaving a gaping hole in the side of the mash tun – and with the help of my fabulous (Much) Better Half and a length of muslin, we managed to drain the first lot of wort into the brew kettle. It was then time to attempt an improvised sparge – at which point I discovered that the hot liquor tank (i.e. an old chilly bin) had been leaking all morning, and thus contained barely any fresh water. Dagger dagger dagger exclamation mark dagger dagger skull-and-crossbones. In a speech bubble. I was left with a rather sad-looking collection of murky liquid – more garbage water than wort – but I was beyond the point of caring. This murky f**king liquid was going to be beer. And then something remarkable happened: as soon as all that murky liquid was bubbling-away in the brew kettle, things started getting better. I was back in familiar territory – having boiled my fair-share of liquid malt extract – and I slipped back into the boil routine with effortless joy. With one sniff of that delightfully-pungent hop aroma – Amarillo from the U.S., in this case – the frown that had settled like scar tissue was forced upside-down. After the boil, a crash-cool (in the family bath, no less) and a healthy dose of U.S. ale yeast, I shut the fermenter lid tight – and with that, the inaugural Brew Hui brew day was over. Walking back outside to the deck that had served as my brewhouse, I collapsed in the corner with a bottle of Three Boys Porter – a gorgeous drop from one of my favourite breweries – and drew long, deep sips from my glass. 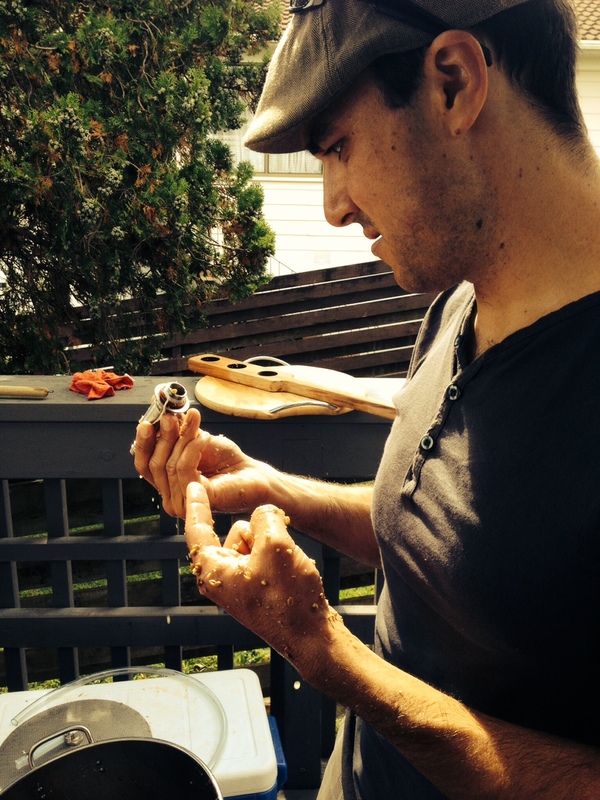 With muscles aching and brain ditto, I stumbled across an epiphany: brewing is hard work – and Being Good At It is even harder. Sitting in that sticky corner, I resolved to never-again write about a brewer’s creation unless I’d approached the task with the same degree of thought and effort as they’d used to create it.